Best film I have seen in ages. It was a good biographical film that shows how hard it was for female writers to get published before 1920. 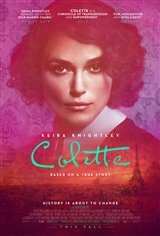 Colette was an excellent novelist. The review below that compares it to "Big Eyes" is really silly. There is no real comparison. It puzzles me that someone would even try to make that comparison. Can't you edit these reviews for relevance. Such reviews really misguide the potential audience! it was good, not great, not bad. Hated it. Cliche, anti-men and pro-lesbian. Skewed point of view. Wonderful Enlightening Authentic I liked the great performances and photography was sensuous. Well done film. Saw it at TIFF! Very strong acting. Saw it at TIFF. Want my money back. Was waaaaayyy better when it was called Big Eyes starring Amy Adams.